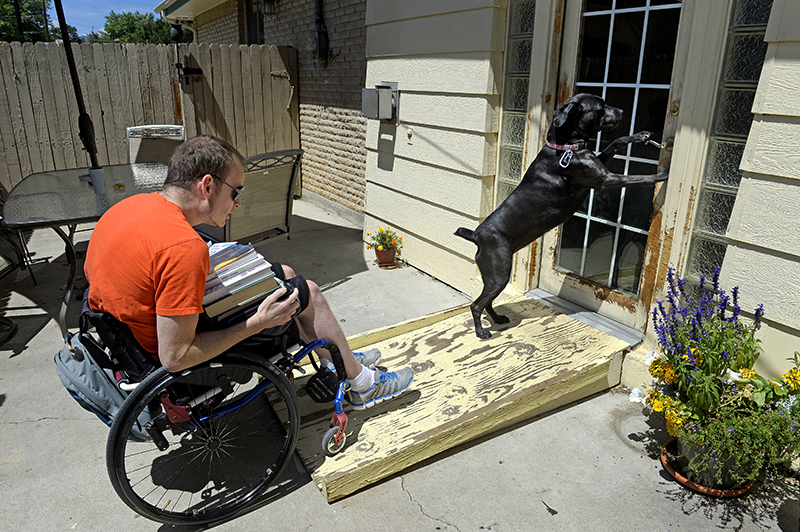 LuLu opens a patio door for James, loaded down with school books at his home in Arvada, CO. He said his dog immediately licked his injured legs when he came home from the hospital, "it was weird, she knew right away... She got me through a lot of this." James is pursuing an accounting degree at Metropolitan State University. In an attempt to help Judy learn to navigate the halls at The Waters of Huntingburg on her own, Judy’s then-caretaker Michaela Daugherty tried to teach Judy how to find the waist-high railings along the walls. Judy suffered a stroke in 2009 that caused her vision to gradually worsen.